Ambulance staff, including paramedics, are to be balloted over whether they would be prepared to take industrial action over pay, UNISON General Secretary Dave Prentis announced today (Monday). Speaking on the eve of the all-out junior doctors’ strike, he warned they will be next on the picket line unless Jeremy Hunt honours promises made a year ago to improve pay and conditions. 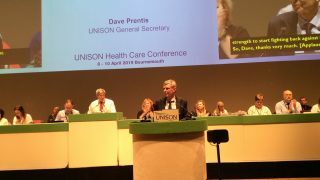 In his speech to UNISON’s annual health conference in Brighton, Dave Prentis said: “We will be launching a consultative ballot of UNISON ambulance staff asking if they’re willing to take industrial action over pay, following promises made at the end of last year’s national dispute. “Deliver on your promises Jeremy Hunt, otherwise ambulance workers will be joining the junior doctors on the picket lines. From car crashes to cardiac arrests, ambulance workers deserve respect for always being there and caring for the public. Dave Prentis also accused the health secretary of putting lives at risk by failing to reach a deal with junior doctors over pay and conditions. Dave said: “Jeremy Hunt said junior doctors are putting patients’ lives at risk. There’s only one man putting lives at risk, and that’s him. I’ve been proud to stand alongside junior doctors on picket lines. Their treatment by this government is appalling. “Jeremy Hunt should hang his head in shame, turning down the olive branch that has been shown to him. Why should health workers have any confidence in future negotiations if the secretary of state feels he can impose what he wants when he wants. 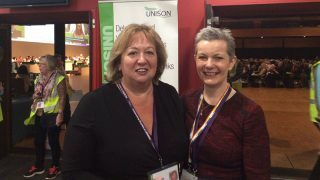 “The message from health workers is that they are standing shoulder to shoulder with striking junior doctors, and tomorrow I will be on a picket line in Brighton. · Jeremy Hunt made a pay offer to NHS staff in England in January 2015. This contained additional proposals for ambulance staff over recruitment and retention which have yet to be honoured.